As if to test the will of Pro-lifers, a major blizzard was headed for our nation’s capitol. The weather forecast was quite accurate on January 22nd. It predicted that snow would begin around 1:00 pm and it did. I was there. It was a terrible storm in the making and anywhere from 2-3 feet of snow was expected. Many who came knew that they most likely would get stuck on their way back home; but they came nonetheless. The tragedy of abortion, the murder of 50 million human lives, far outweighed the risk of getting stuck in the snow. A gigantic blizzard and a declaration of emergency by the mayor of Washington was not enough to stop the marchers on Capitol Hill this past Friday. As for the truth, a close estimate of Pro-lifers who were able to make it was around 40 to 50 thousand. 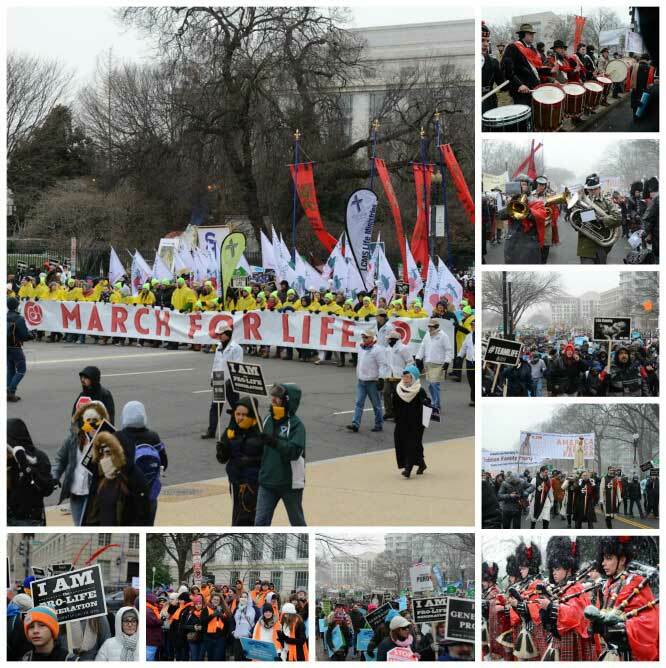 The pictures make a plain testimony to the amazing 2016 March for Life in Washington, D.C. Talking to participants while waiting for the March to begin, it became clear that many more would have been there if it were not for bus companies cancelling out. America Needs Fatima and the American TFP were privileged to be there in full force. Banners, standards and a remarkable music band all showed up to offer reparation. One of the banners carried by two ANF members displayed 9,299 names of ANF members and supporters who could not be present, but wanted to be there in spirit. As we marched towards Capitol Hill, the snow-covered band members were a sight to be seen. To play trumpets, trombones and fifes in 28-degree weather under snow is something to be commended. The marchers began to assemble near the Washington Monument at the rally around 10:00 am. Different speakers addressed the crowd as other groups kept coming in from a variety of far away places. The challenge began within these first three hours, braving the below-freezing temperatures. The snow began to fall just as the March commenced, around 1:00. But the real beauty of the event was that, in spite of the inclement weather, the fighting spirit of the thousands of marchers remained undaunted. 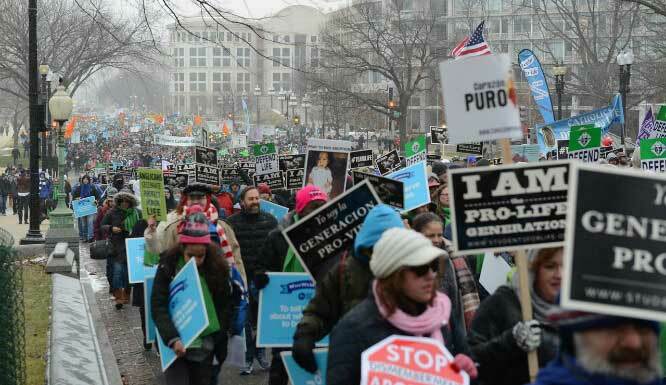 The March was considerably longer in distance this time, which gave all the feeling that they were on a pilgrimage, offering up their sacrifices for the end of abortion. For those privileged to have been there, the “take away” was a sense of determination and a renewal of our resolution that we are here to stay. Furthermore, a great percentage of marchers were young people, many of who were not even born when Roe v. Wade was decided. This means the 43-year-old March for Life has a very long life ahead of it. The abortion tragedy in America is a macabre illustration of the state of our modern culture. The fact that the sin of abortion has been around so many years, staining our nation with its murderess blood, is something that requires a public act of reparation to the Creator, and this is for many the higher reason for joining in the March for Life, no matter how foul the weather. If thousands of Americans side with sin and against God, the fact that many thousands more align with Him and every year present this great act of reparation called the March for Life is something that speaks of hope for our troubled nation. We offer it to God and we proclaim that no matter how many times we have to do it, we will always be there. We will not make a pact with evil, and we will not commit the sin of indifference.